Heading down the N11 Orion directly in front of me - nice. 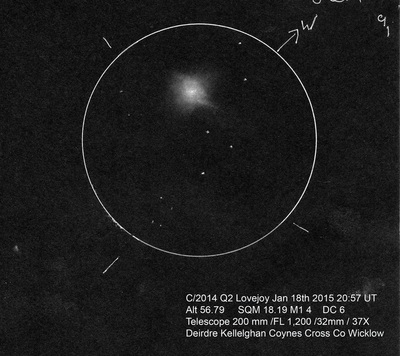 Coynes Cross is a bit darker than Bray my intention was to sketch Lovejoy and hopefully see and include its fine tail. Set up my 25x100's only to find that the comet was so high ( 56.79 degrees) that I was unable to angle the binoculars to catch it at that time. The double cluster was naked eye , M31 with averted gaze. Comet not naked eye. Luckily I had thrown the dob in the car. I had used previously with the binoculars. A massive circular coma with a bright stellar centre. The edges seemed wispy almost like a fringe. 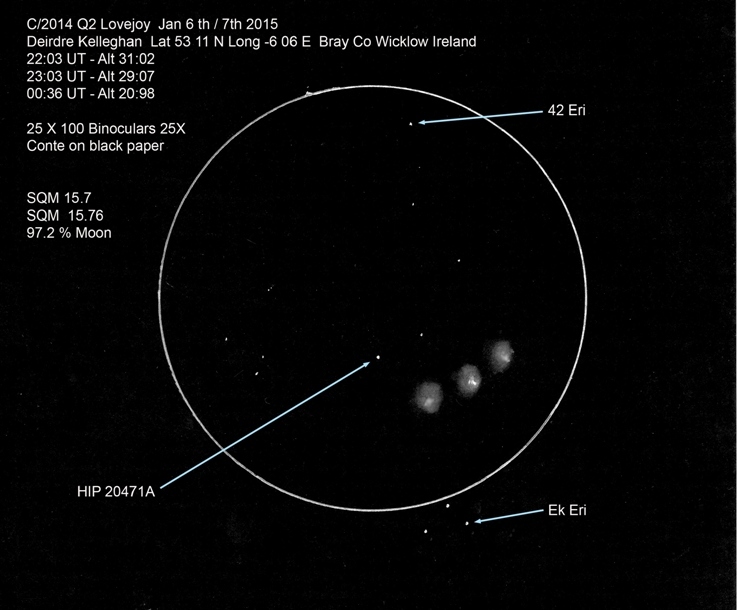 I was more aware of the particles within Lovejoy in the telescope view , even though they were dense and obviously abundant. The entire coma appeared radiant and although it's shape was simple and beautiful its complex dynamics proved very difficult to capture. Material seemed to be jetting out in several directions . However in my view no fine ion tail even hinted itself to my eye. The coma's white mass had a very distinct bright point centre surrounded by dense less bright material. Toward all edges the edge seemed to continue but what the shape or structure was not clear no matter how much I looked and looked . Later at home Lovejoy had dropped in height to 29 degrees and was comfortable in binoculars. I was seriously surprised when I could see some tail, and I even noticed tentacle like gas streams for a short time . My only conclusion is that even though the comet was lower the seeing must have improved because the transparency had not . Similar moments happen when observing Jupiter's banding . A few seconds of improvement in the atmosphere can reveal detail hidden to the eye sharply but briefly. I didn't tidy up these images as that would lose some of the fine detail I mention in the observation. 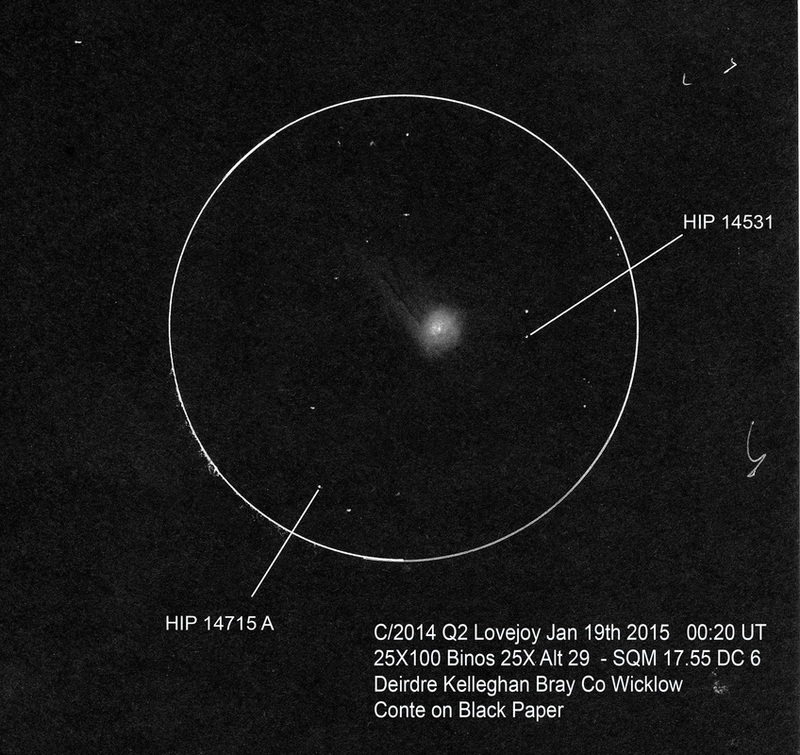 After an extremely cloudy evening an inviting clearance had me outside with the binoculars keen to view Lovejoy again. My 10X50's showed indicated that the comet was both larger and brighter than my view on January 12th/13th. I carefully drew in the stars in the Taurean field, even though Lovejoy was not at a particularly high altitude at the time , the brightness of the coma was delightful. In the first few seconds I noticed a very slight green tint, but this disappeared as I began to draw. The material being produced from the comet was elongated with the most material above the central condensation and less below. The coma was also slightly fan shaped and had a lean toward the left . No tail was visible to me , the comet was not naked eye. While the coma had got larger the material had not become any less dense. The expansion of this material is I believe not an outburst but rather an increased production of dust. The shape of the coma is do different to 17/P Holmes which was almost a perfect circle most of the time. C/2014 Q2 Lovejoy has a dense coma whereas 17/P Holmes had a coma that was so thin stars could be seen through it as it expanded in space. Three sketches of the comet within the same sketching frame /FOV over time. perhaps brightening a little more at one point. My first view of C/2014 Q2 Lovejoy on January 6th was so exciting as it appeared larger and brighter than my view on January 1st. The coma was wider and was itself much brighter , the condensed central mass was noticeably distinguished and more pronounced than before. The green tint was not visible to me on this occasion , the central mass seemed to dominate the view . Its glow or activity seemed to be lighting up the particles in the coma. The tail was not visible to me but the asymmetric nature of the comet was. As a major storm was on its way I again stayed observing from my home. Between my second and third observation I engaged my better half to help me move the giant binoculars and tripod to a nearby field. Even though the dark sky reading was darker the tail was not visible. Earlier in the day I decided that the most interesting thing I could do with this session was to sketch the comets movement over time. Placing the comet in the same FOV for three separate times was a plan aimed at making a short video showing the motion of the comet over time. The three stars above Lovejoy HIP 2047IA HIP 20431 and HIP 20407A were a perfect reference set. 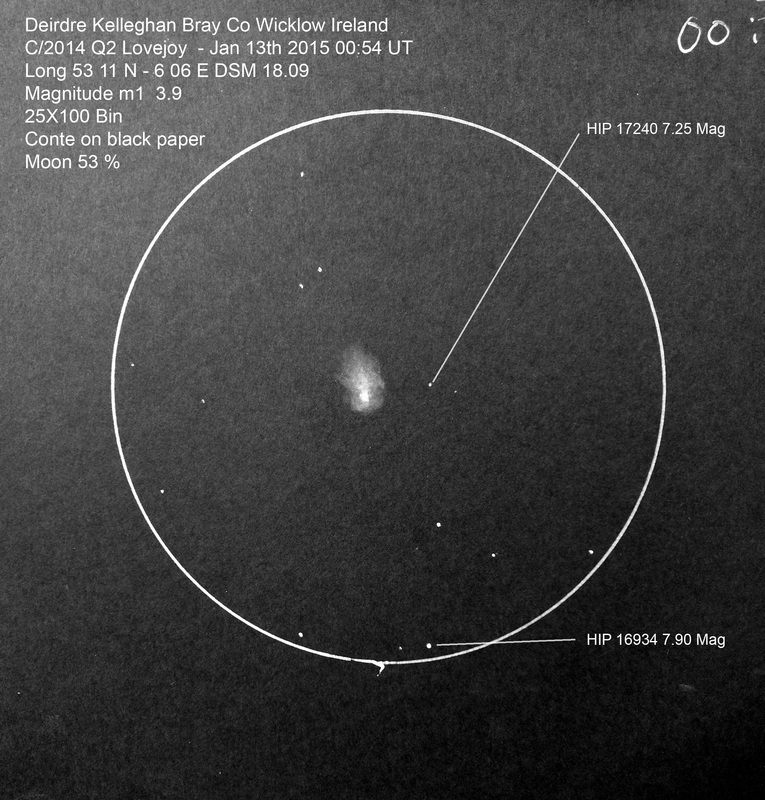 A small triangle of stars which I deliberately placed outside my sketching circle were also very useful for judging the changing position of the comet as it moved during my observations. 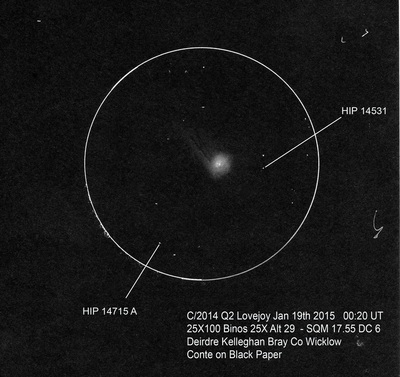 C/2014 Q2 Lovejoy January 1st 2015 - Conditions were far from ideal , it was very windy and cloudy with too much moonlight. In between the cloud gaps I caught a glimpse of the comet in my 10X50 's so I decided to set up my 25X100 's binoculars in hope of a sketch. 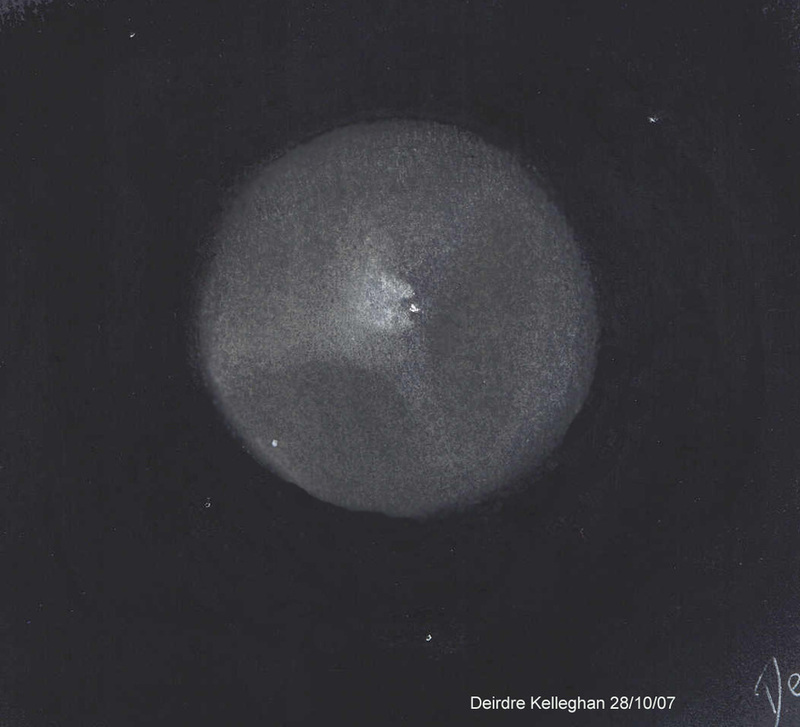 In Ireland , it is always a possibility that this could be my only opportunity to sketch this comet for days or weeks. Engulfed in Virginia creeper twigs I waited for a break in the relentless fast moving cumulus. The coma was large, the nucleus looked kinda oblong, not a pinpoint, not circular. There was no tail visible to me but the coma was asymmetric in shape, with a tint of green,diffuse at the edges. Nice star field on the edge of Lepus. Mag 5 - 25X100 Strathspey binoculars on a Manfrotto tripod. Pastel and White Gel pen on black paper. 22:48 UT - 23:39 UT long sketch due to conditions. 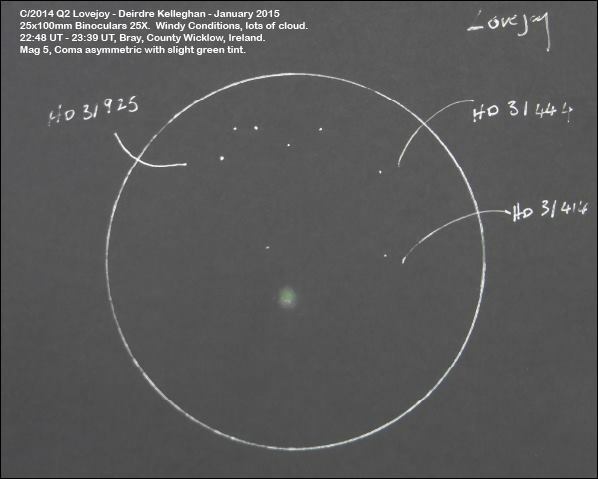 C 2011 L4 Panstarrs from Bray Co Wicklow. March 30th 20:49 UT. 25 X 100 Binoculars , pastels on black paper. Alt 10 degrees. Distance 1.27 AU from Bray and my eye. Thrilled to see it , the sketch is a bit rough. Just a fleeting glimpse of the fan shaped tail, not long enough to include. The star in the middle just beside the comet was Pi π 29 Andromeda. Nucleus bright and I guess about Mag 3.3 as it was brighter than Pi And at 4.3 . Thank goodness for Mirach guiding the way, lots of low creamy cloud in the NW. I was both lucky and thrilled to see it , did a little dance lurking in the shadows :-) Shared it with some people walking by. Here is my sketch from October 28th, I got going early to avoid the predicted cloud cover. I had a long look into the halo around the nucleus. The material emanating from the pin point center seemed to be heading in a more southerly direction than I had observed in previous evenings. I could see darker areas fanning in the opposite direction in the inner halo. A star was visible just inside the outer halo. Because I could see a star through the out gassing then it must be very thin? 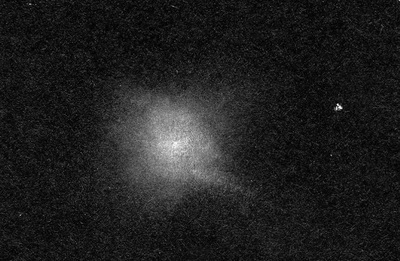 The star was visually similar in size to the comet nucleus but a little dimmer. Sometimes the coma seemed to momentarily have transparent spaces within it. I have not seen a star in the area of the dark spaces, I wonder if these spaces are filled with dust? All this was visible even though there was a 17 day moon rising almost directly under the icy action.